DVD Edition Year: 2009 Special Features: LOTS - See Picture #2 of Back Cover! 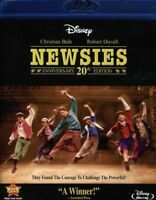 When I was a teenager, I watched Newsies on VHS cassette tapes. As my children are getting a little bit older and have been enjoying their Disney films on DVD, I have started purchasing some of the classics that seem to have disappeared from the shelves of big box stores. 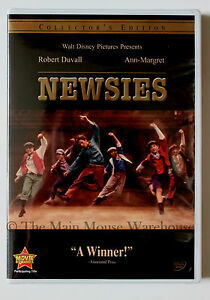 I was very excited to find that Newsies was released on DVD, and I swooped on the opportunity to own it. Newsies is an excellent musical tale of courage and the ability to overcome circumstance. It is based on a true story that is set in the streets of NYC in the early days of newspaper tycoons Joseph Pulitzer and William Randolph Hearst. Newsies stars Robert Duvall and Ann-Margaret, as well as Christian Bale (Batman Begins/The Dark Knight) and Max Casella (Doogie Howser). It is choreographed by Kenny Ortega, of High School Musical fame. One of my favorite aspects of Newsies is the cast and crew, as well as the choreography. I have grown up watching these particular actors, so I am enjoying having one of their earlier works in my collection. My husband and I have wanted this movie for a while, but couldn't find it in stores. I bought it for his birthday, and he was really excited. He's not a huge fan of musicals, but he really likes Newsies because it's not your typical cheesy musical. It's a clean movie, with a good moral, which is one of my favorite things about it. There's a little bit of history mixed in, the cast is talented, the story is fun, the dancing is good, and the songs are pretty catchy. There isn't anything I don't like about this movie.. I take that back, the sister kind of bugs me, but other than that it's a great movie and I think everyone should have it in thier collection. This movie has got to be one of the best musicals I have ever seen. As a teenager, of course, I love the lead role of Jack Kelly being played by Christian Bale, but the music, and the dancing is phenomenal! One of the absolute best disney musicals, and this is comeing from someone who prides herself in not only loving musicals, watching musicals, but also performing in them. Some of the acting is a little over dramatic, but the musical is quite amazing. One of my absolute favorites that a recomend for any musical lover from the age of 2 to 92. WARNING: The songs WILL get stuck in your head! Great Musical For The Whole Family! This musical was made back when musicals had a compelling story and the songs made sense to what was going on. The actors in this film are great, the story is sound and well written and the over all feel for the film is wonderful. I recommend this film for any one looking for a good musical to watch with their family. I first watched this film for choir class when I was 14 years old, and now 16 years later I am buying it for my kids. I hope every one else who sees this film can enjoy it as much as me and my family has. This is one of our family's all time favorite movies- it has a lot of energy and keeps you engaged- while apealing to kids young and old- The music is great and the plot is riveting! Must see- should own..